EISA opened an office in Madagascar to facilitate a capacity-building programme for women candidate parliamentarians in preparation for the Madagascar 2007 Parliamentary Elections. 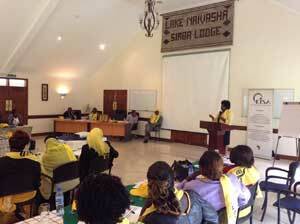 The main objective of the programme was to encourage women's participation in and access to political life. The office was staffed by a project co-ordinator, Claire Bless, and a programme officer, Nirina Rajaonarivo. Whilst EISA has always mainstreamed gender in its programmes, this was a challenging project as it provided EISA with an opportunity to focus specifically on encouraging women to engage with and actively create a space in decision-making processes. EISA used the parliamentary elections in 2007 in Madagascar as an entry point in laying the groundwork for actively encouraging women to engage with political parties to ensure their inclusion as potential candidates, identifying appropriate women to participate in a capacity building programme across the political spectrum, and building the capacity of potential women candidates to enable them to stand as candidates. EISA's project to encourage the inclusion of women in the political life of iniated 2007 was extended a further three years, supported by the Norwegian Embassy. The programme included participation from a range of stakeholders including political parties, mayors, local councillors, non-governmental organisations, faith-based organisations, women's associations and members of Parliament. Madagascar was one of two countries, together with the the DRC, to benefit from the pilot legislative support programme aimed at strengthening selected parliaments in Africa and encouraging interaction between parliaments and CSOs for improved citizen participation in the democracy and governance arenas at national level. The development of a national and regional campaign to lobby for 30% representation of women in decisionmaking processes. Facilitating a capacity building programmes for women's empowerment. establishing & maintaining a documentation and resource centre. The United Nations Population Fund (UNFPA) funded, jointly with the Royal Norwegian Embassy, two workshops for women's capacity building at local level in two regions. In addition the UNFPA provided support to reinvigorate the Network for African Women Ministers and Members of Parliament (REFAMP) Embassy, and a programme to train women officials and declared candidates for the forthcoming parliamentary elections and municipal councils in the Comoros. The main challenge faced by the programme during this period was working within the tense political situation, a result of the unconstitutional takeover of the government. This situation continued throughout the year and resulted in the suspension of Madagascar from both the African Union and SADC. Despite this situation, the Madagascar office was able to continue with its main activities. 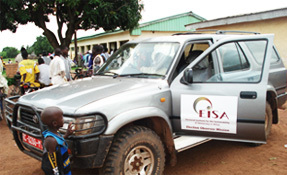 EISA developed partnerships with, and received support from, a broad range of stakeholders working in the gender field. In particular, EISA supported the formation of the Vondrona Miralenta ho an'ny Fampandrosoana (VMLF), an association of women supporting and working towards increased female representation in Malagasy political institutions.Through this support, EISA gave the VMLF the opportunity to express its ideas and points of view concerning the contribution that women can bring in resolving the conflict. The members of VMLF in turn, ran an intensive press campaign to advocate for a minimum of 30% of women in decision-making processes. The campaign targeted leaders, political parties and the civil society at large. Further than that, the group continued to advocate for peace through increased press releases. EISA's programme also extended to the Comoros in 2009 with the Institute being invited to provide training to women candidates. The EISA "Women's Participation and Contribution to Governance in Madagascar" programme, with the continued support of the Royal Norwegian Embassy, Madagascar, provided training for women in rural areas as well as women at local level, including women already in decision-making positions such as mayors. In addition, with EISA's administration and technical support, the VMLF (Women's Movement for Politics and Development) initiated the "Movement 30-50%", as an advocacy tool addressed to policy makers lobbing for the inclusion of 30% and 50% of women in decision-making processes. Workshops were held countrywide and facilitated by EISA trained facilitators using material developed by EISA in consultation with the facilitators and participants. The Documentation Centre, a partnership with the Centre d'Information et de Documentation Scientifique et Technique (CIDST), provided service to the public by extending its collection and analysis of gender related information. The Centre saw an increase in usage by 40% from the previous year. reinforcing the capacity of political parties to be effective and internally democratic. A first country representative and a program officer were appointed in February 2011.During year EISA's capacity building programme to encourage women to participate in decision-making processes was also extended for a further three years supported by the Norwegian Ministry of Foreign Affairs. The VMLF, supported by EISA, actively engaged in lobbying for women's representation in the transitional structures resulting in several members of the VMFL being appointed to the transitional government, including the Minister of Health, the Minister of Culture and the Minister of Crafts. In the two houses of parliament at least 20 women came from the VMLF membership. Although there were no elections, the presence of women in the transitional institutions was a sign that women are interested in politics and are ready to participate in political decision-making. 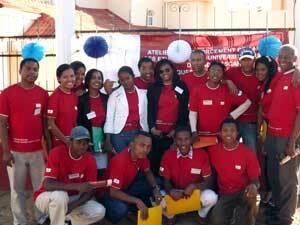 From May 2011 onwards EISA Madagascar developed materials on civic and electoral education and held workshops to train trainers. During the May 2011 Local government elections in South Africa, a team of eight people from Madagascar's electoral Commission, civil society and political parties had an opportunity to meet relevant partners and stakeholders from the South African IEC and share experiences. The Study tour to South Africa was part of the Multiparty Liaison Committees (MPLCs), a programme under the SEDP. 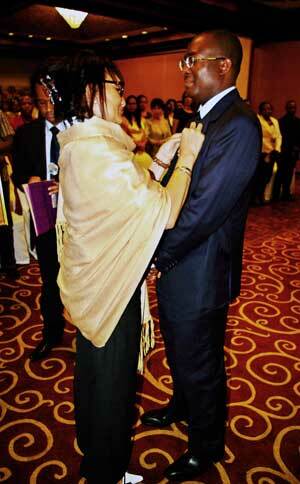 EISA's 2011 activities took place in a context marked by delays in the negotiation process and signing of the Roadmap, particularly the amendment of article 20 of the Roadmap concerning the return of former president Marc Ravalomanana to Madagascar. The Roadmap was eventually signed in November 2011 and provided for the establishment of transitional institutions, government and parliament, the adoption and promulgation for the establishment of the Law on the Independent National Electoral Commission for the Transition (CENIT). The Roadmap also made provision for an agreement with the United Nations (UN) in regard to a date for the organisation of elections. The UN requires that elections take place within 11 months of the establishment of transitional institutions. It is anticipated that the elections will take place in 2013. An area of contention still exists in regard to the amnesty law that has yet to be presented to Parliament by the government as it affects the return of the former President Marc Ravalomanana. Following the signing of the Roadmap, new challenges have been raised by women to ensure a higher representation of women in transitional institutions. Finally, a gender cell at the documentation center was opened. To better engage and fully participate in electoral process, civil society organisations (CSOs) were provided with capacity building in the following areas: election observation, voter sensitization and education, as well as in conflict mediation. EISA also worked with political parties facilitating workshops on strengthening internal democracy and structures. These activities were supported by Danida, Swedish International Development Agency (SIDA) and the Swiss Agency for Development and Cooperation (SDC). EISA also expanded its area of work broadening its programmatic scope and strengthening its work in the country with two additional programmes. The first project supports civil society's involvement in voter information and the second strives to increase Malagasy women's representation in politics and political life. Funding agreements with the European Union (EU) and the United Nations Democracy Fund (UNDEF) respectively were signed in December 2012. A new Country Director was appointed in October and additional staff engaged to support EISA's increased programmatic interventions. After nearly five years of political crisis following the removal from office of the then President, presidential and legislative elections took place in 2013. These elections constituted a critical step towards the return to constitutional order, long term economic recovery, and political stability for Madagascar. EISA contributed to these elections through assisting the civil society organisations (CSOs) in conducting nationwide voter information and education exercise while the Electoral Commission was registering voters. Barriers to gender equality were reduced through an increased awareness of gender equality and its benefits for the whole society. Political parties and CSO's were equipped with skills and knowledge on poll watching to increase their effectiveness during the polling process and ultimately contribute to the transparency of the elections. In this same period, EISA worked hand in hand with electoral authorities and security forces to ensure a timely and effective response to any potential threats of conflict and violence that would impact the successful conduct of the elections. Since the 2013 elections, Madagascar has gradually engaged in a processes to restore stability and establish sustainable peace however a year after the accession to power of the current President Hery Rajaonarimampianina, the atmosphere remains tense. During 2014, the country experienced a repetition of political turmoil mainly related to strained relations between government and the National Assembly. Disagreements on the interpretation of the National Assembly regulations heightened inter-party tensions particularly between the regime and the Miaraka Amin'ny Prezidà Andry Rajoelina (MAPAR) party of the former President of Transition, Andry Rajoelina. These divisions led to the dissolution of the Permanent Bureau of the National Assembly chaired by MAPAR, in April 2014. Although this crisis changed the configuration inside the National Assembly in favour of the Plateforme pour la Majorité Présidentielle (Platform for the Presidential Majority; PMP), which supports the ruling party Hery Vaovao ho an'I Madagasikara (HVM), the situation remains fragile. In the absence of a parliamentary majority, government and the President are frequently required to make concessions to political alliances which are often unpredictable since they are subject to the particular interests of each of the parties composing the PMP. The absence of a strong majority in the National Assembly and a continuous climate of mutual mistrust has obstructed the effective functioning of the National Assembly. This institutional weakness was reinforced by the inexperience of the newly elected parliamentarians. On the positive side, the National Assembly is one of the leading public institutions favoring the participation of women following the 2013 elections during which 32 women were elected. Despite this positive trend, women's access to decision-making bodies remains a challenge. For instance, there were only six women among the 31 Ministers in the government of the former Prime Minister, Kolo Roger, and this number has not changed with the formation of the new government. In an effort to remedy this, EISA continued to deepen and reinforce its activities supporting gender equality and women's empowerment. At national level, support was given to political parties as well as key ministries such as the Ministry of Justice and Population. Women's networks and students, contributed to an awareness of the need for increased participation of women as decision-makers. EISA has also expanded the gender related information it provides through the publication of disaggregated statistics on women's representation and an in-depth study on gender mainstreaming in the legislative process. Since September 2014, EISA implemented a parliamentary programme to improve the effectiveness and efficiency of the National Assembly through a range of activities including capacity-building for all parliamentarians. Moreover, with the aim of maintaining the positive trends created by the record presence of 32 women in the lower House, EISA gave technical support specific to the Gender and Development Committee and the Caucus of Women Members of Parliament (MPs) for Gender Equality. Given the above, EISA is now one of the active partners of the National Assembly in training and providing support to its members. 17 months after returning to constitutional order, May 2015, Madagascar continued to face a crisis as there was a motion tabled to impeach President Hery Rajaonarimampianina for incompetence and violation of the constitution. EISA's activities were resultantly postponed as they relied on the prevailing context of the National Assembly. Given this situation, the support to women and elected representatives programme had to be suspended. In October, EISA's Executive Director met with the Speaker of the National Assembly, the Speakers Chief of staff, the Secretary General and the two vice Presidents to discuss the collaboration between EISA and the lower house that has been in place since 2014. The meeting re-established the willingness of all the parties to work together in strengthening the National Assembly. The 2016 reporting coincided with the first parliamentary session of the year, which was also the very first session for the newly established Senate making it a conducive space for EISA to implement its programmes and activities. In spite of underlying political and social tensions, the Independent National Commission for Human Rights was established as set-out by the Constitution. The National Reconciliation Bill, as well as the reform of the Nationality Code; were also adopted by the Parliament. It is worth noting that this reform is a major step in the quest for gender equality in Madagascar. This reform provides for Malagasy women being able to transfer their citizenship to their child. The adoption of this law by Parliament shows the willingness of MPs to improve women's rights. EISA through its gender sensitisation and advocacy programmes is pleased to note that these reforms were part of the recommendations it made in gender mainstreaming reports since 2014.